This is the original account of the extraordinary activities of Sri Krishna, who appeared on earth 5,000 years ago. Find out why He has enchanted people for centuries. Always remember Krishna, God. That was the goal of the rich spiritual culture that flourished in India for thousands of years. Even today Lord Krishna is remembered and glorified through monumental achievements of art, architecture, drama, music, dance and philosophy. Fifty centuries ago Krishna descended from the transcendental world to show us His eternal spiritual activities. His acts reveal the fullest concept of God and attract us to join Him again. They are tangible subjects upon which to meditate. Sri Krishna’s life is fascinating and highly entertaining. Even children love the stories. His life is full of deep philosophical wisdom and spiritual insight, and is a window into the personality, thoughts, and feelings of God. 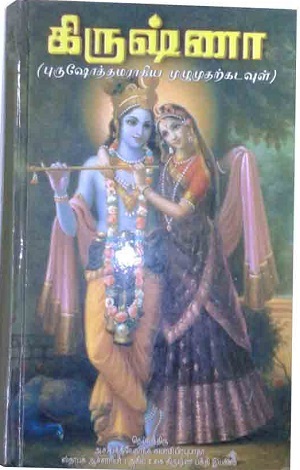 Krsna is a summary study of the Tenth Canto of the Srimad-Bhagavatam. Without the Sanskrit of the Bhagavatam it’s an easy way to read yourself into the spiritual realm.